Over the last few years, The Praguery food truck has been serving delicious European desserts across Vancouver and the Lower Mainland. From chimney cakes to our sweet Prague cones, we’ve got something for everyone to enjoy. Our dessert food truck has become so popular, we even have families visiting all the way from Abbotsford to pick up our sweet treats! And so off we went. Our first time at the Calgary Stampede was in July 2018, and it was one for the books. The Calgary Stampede is an internationally-recognized annual rodeo and festival held in Calgary, Alberta, and attracts over one million visitors every year. 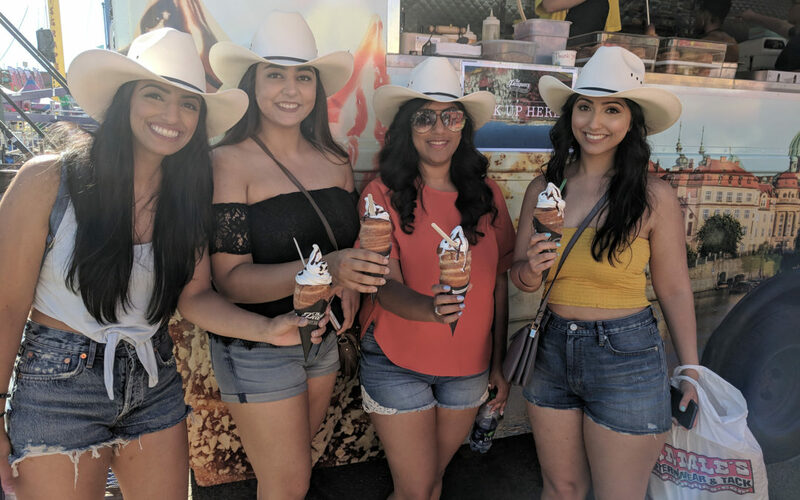 The entire city transforms for the Stampede, with people decking out in western gear and taking part in Stampede-related festivities throughout the city. It’s got rodeos, a parade, concerts and….food. Lots of it! There were hundreds of vendors throughout the event grounds but event-goers quickly gravitated toward our Vancouver dessert truck. The sweet smell of chimney cakes is intoxicating, after all! We were delighted by people’s enthusiasm for our desserts. In fact, we couldn’t make our chimney cakes fast enough. We made sure to prepare all our fan favourites for festival-goers, including the pastry that has become our signature: the Prague cone. The rotisserie-baked pastry with cool vanilla soft serve and sweet filling was a welcome relief for visitors on those scorching July days! Not to be outdone, our classic chimney cake was also quick to fly off the shelves, dispelling the perfect amount of sweetness. Spread the sweet tooth. Share with friends to let them we’re coming to the Stampede this summer!